"...a well conceived practical guide to the interpretation and treatment of the main cardiac rhythm disturbances." "This book presents a concise and simplified approach to the diagnosis and management of abnormalities in cardiac rhythm.... One of the book's strengths is the number and quality of electrocardiographic tracings"
"...this book provides an excellent foundation for all those involved in the care of arrhythmia patients"
"…would recommend it unreservedly to anaesthetists who wish to improve their knowledge of cardiac arrhythmias"
"This book about cardiac arrhythmias is of much educational value"
"Bennett’s cardiac arrhythmias offers a comprehensive overview of the mechanisms and management of the most commonly encountered types of arrhythmia in clinical practice. A large variety of good quality examples are provided appended with concise explanatory notes......not only does the author outline and exemplify mechanisms and types of arrhythmia, but he also provides an introduction to electrophysiological principles and catheter ablation for arrhythmias. The basic principles of device functioning and programming are beautifully and clearly outlined in their respective chapters …. Chapters focusing on anti-arrhythmic agents, with details on mechanisms, indications, and recently introduced anti-arrhythmic drugs, including those allowed to be used in pregnancy, as well as arrhythmic problems encountered in athletes, add more to the comprehensive nature of this book. 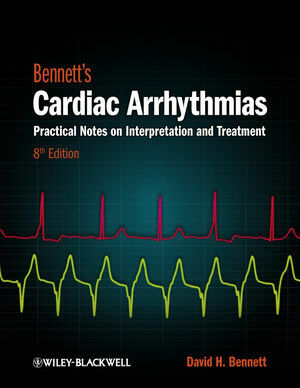 “…contains detailed ECG tracings of almost every variation of arrhythmias, and combines with detailed descriptions and clear explanations. It then goes further, with in-depth explanations of aspects such as antiarrhythmic drugs, cardiac pacing, implantable defibrillators, and catheter ablation. Every step of the way, this book concentrates on the practical aspects of arrhythmias by giving advice on identification and treatment, as well as “what not to do.” This book will be of use to all grades from trainee up to consultant.